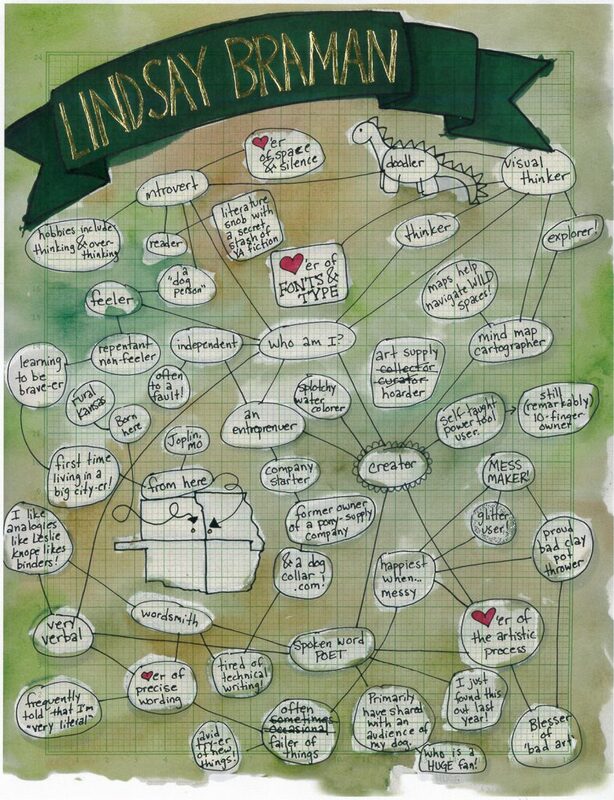 In this post, rather than sharing a layout or a technique tutorial, I wanted to share one project where mind maps, doodling, and visual thinking combined with art to create a visual representation of… me! My first assignment in graduate school was the casual prompt to: “Tell ‘Who I Am’ using one side of a flat 8.5×11 sheet of paper.” A mind-bending challenge (true to the spirit of my particular school), I began to brainstorm this project via mind map, and as I mapped, I realized this- this visual representation of a visual person, did a great job of representing who I am. I used layers and mixed media for this project, and I wanted to share my process to show how mind maps can be layered with other media to create a 2-D art piece with a lot of depth. I started with a basic mind map, spreading main points around the page and branching off them to fill the space with relevant data. In spaces I wasn’t comfortable using pen at first, I used a non photo pencil, which lays a particular blue that’s easy to remove with photo editing software just by editing the blue channel. My first draft was pen and ink, with some blue pencil I later removed after scanning. I knew I wanted a messy background inspired by the messiness of the creative process, so I used tracing paper to locate the mind map bubbles, draw them in blue on my watercolor page (to be removed post scanning- this only works if you DON’T use blue in your paint), and messily blended watercolors for a background. I was pleased with the result, but the final steps added a little more depth. I photocopied my design onto a page I’d already copied vintage graph paper on, then used a gold-writing kit from a vintage stationary-kit I’d bought at a stationary store, added some glitter (obviously) to the glitter-user identifying bubble, and finished my piece.